If you would like to be notified whenever things are added to Kittywompus, please let me know. I'm now updating an iMac migration weblog. A very merry Christmas to all of you. 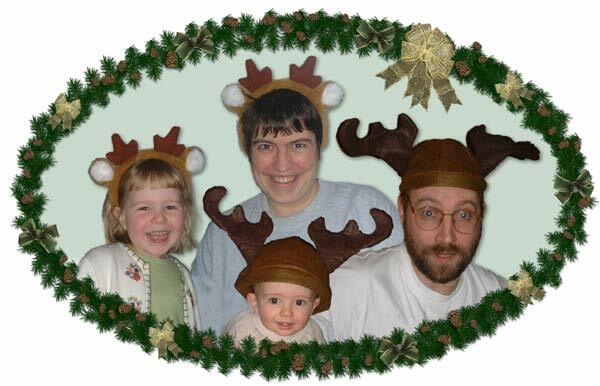 I've added our 2001 Christmas card and newsletter. An entry into rec.arts.sf.fandom's Cute Wars. Jonathan's website has also been tidied up, though it's very out of date. And I got an e-mail from (I presume) a women's underwear fetishist, asking if my article about bras from Attitude was online anywhere. So, specially for him, here it is. I've also tidied up many other things around the site. Photos of our trip to the Natural History Museum with Jo and Sasha Walton and Emmet O'Brien. An update to the fanzine log. First photos of Jonathan Andrew Cain on his homepage! And there's now a photo of all four of us on the family index page, too. I've updated the fanzine log, including a photo of Meriol Ameringen, and finally put some links on the links page. I've added some photos of my brother's wedding, and I've updated the fanzine log. A substantial update to the fanzine log, Bridget Bradshaw's one-shot from <plokta.con>, and a page exhorting you all to buy No Moose Today, Thanks. A review of Cheryl Morgan's Emerald City on the ezines page, and reviews of Arnie Katz' and Tom Springer's Baloney, and the souvenir programme from SMS & Eira Latham's wedding in the fanzine log. I've updated the fanzine log and the web log. I've added a second search box to the home page, this time as a way of recommending Google as the best way to do general web searches, whether on fannish or other topics. I've also added a Blogger weblog page, which I can update from anywhere I can get web access. I've moved some photos off the old pages into the photo section here. I've added a search box to the home page, courtesy of the nice people at Atomz.com, who provide their search engine free for sites smaller than Plokta. Thanks to Phil Bradley for the idea. I've put up a version of my 1996 fanzine Trinketry. And about time too, you might think. You would be right. The fanzine log is coming along nicely, and I've added a review page for e-zines. And I've put up a list of <plokta.con> members on the Plokta website. The site is up, in a rather rudimentary form, and the various Fuggles pages have been moved over. The old website will no longer be updated.